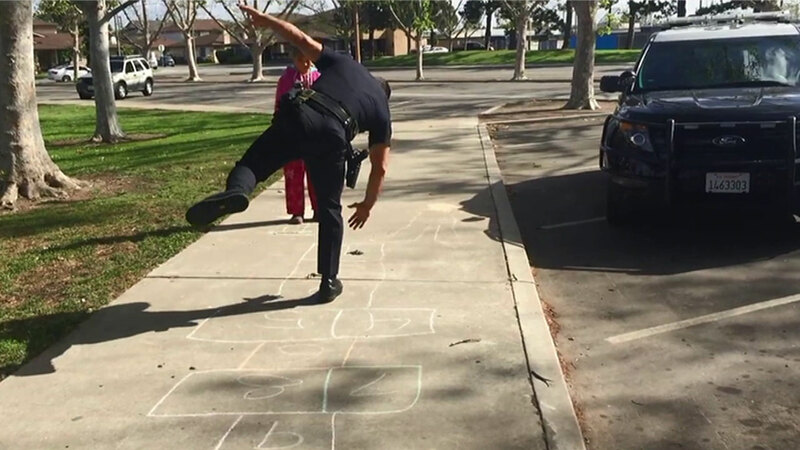 HUNTINGTON BEACH, Calif. (KABC) -- A Huntington Beach police officer showed an 11-year-old girl his hopscotch skills Wednesday morning. The Huntington Beach Police Department received reports of a suspicious car with people inside in the area of Graham Street and Edinger Avenue. When an officer began investigating, he learned a mother and her 11-year-old daughter were living out of the car. Authorities contacted the local homeless task force to help arrange housing for them. As that officer worked on housing arrangements for the mother and daughter, Officer Pricer arrived on scene. Pricer began playing hopscotch with the young girl and showed her a thing or two.